Sew-To-Fit by A.D. Lynn: Week 3: Part 2- Designing More Skirts: Yokes, Gores, A-Lines & No Math Circle Skirt!! Well, guess what, you should know the answer to these questions. If you don't, then you have missed the best video in the entire series!! Don't be dismayed, I have it here for you to check out on your own schedule. Although, I did miss you on our regular 8pm CST, on Thursday night, live during the YouTube session. Just so you know, I did change the format of the live video just a tad to make it easier for those of you who "say" you hate live. WHATEVER!! I'm gonna do live either way. Just saying. But, if you really just can't make it, because maybe you have some adult stuff calling you at my regular time, then trust, I'll always leave a replay for you. But, only if your are subscribed to the channel, shhhh, I don't make the video public right away. So, in order to get it when it comes out, you have to do something, to get something. hehe. Always, a catch right!!!???? 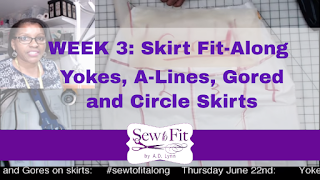 Anyway, checkout WEEK 3: Skirt Fit-Along: Yokes, A-Lines, Gored and Circle Skirts. Here is a cheatsheet of where to find all the topics in the video. Each part is timestamped below for you to fast forward to the exact topic you are interested in learning more about. The complete playlist of all the videos from the beginning are listed in the sidebar or here.